As I looked out my window I spot an uninvited guest arriving. It settles on a branch near one of my sunflower feeders and begins looking around. 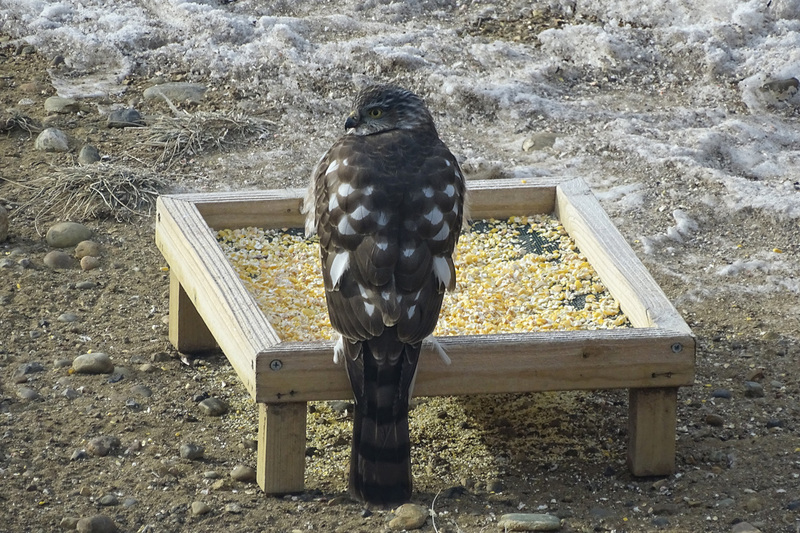 A little larger than a robin, but smaller than a crow, this hawk did not come for the seeds. Visitors to the Draper Museum Raptor Experience https://centerofthewest.org/explore/greater-yellowstone-natural-history/raptor-experience will at times tell me that a hawk is hunting small birds at their feeders. They give me a description of the raptor, and sometimes even show me a photo on their phone. 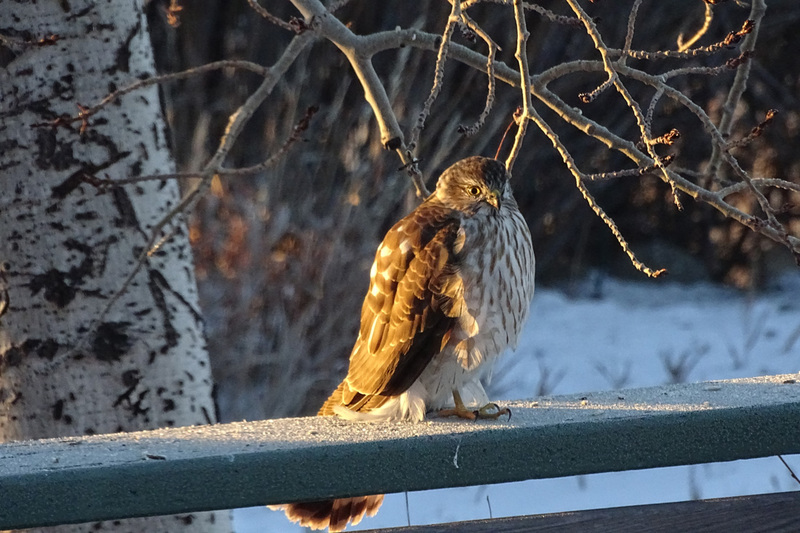 All followed by the question, “Do you know what this bird is?” In our area of the country, along with most other areas of the country, the most common raptor to be drawn to bird feeders is the Sharp-shinned Hawk. Both immature and adults may prey on birds at your feeders, and it is easy to tell them apart. In the opening photo you will notice that the Sharp-shinned has horizontal markings on its breast, and a blue-gray back. These are the markings of an adult. An adult will also have red eyes. The photo above is of a juvenile. Its breast markings run vertical, its back is brown, and its eyes are yellow. Many times these differences alert me to the fact that I have more than one Sharp-shinned that considers my bird feeding area a good hunting ground. 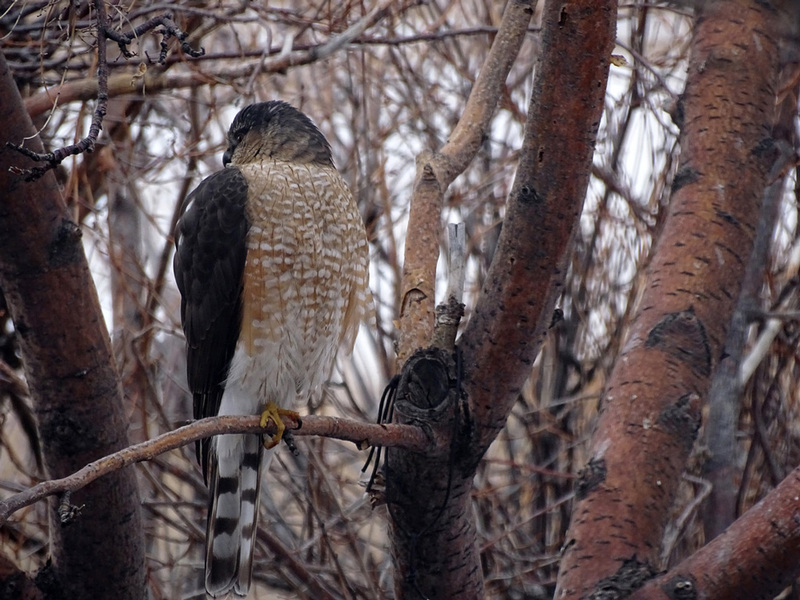 Another way to differentiate a Cooper’s and a Sharp-shinned hawk is by looking at the tail. In the photo above you will see that the tail is rounded. Looking at the tail from this angle is particularly helpful. You can see that the feathers, when folded in a resting position, do not lie all at one length but are offset with some being shorter. This would indicate that, when fanned out, this tail would be more round than straight. A Sharp-shinned’s tail is more squared-off at the end. The problem with this method is that if the hawk is molting so that it has either lost feathers or is growing feathers in, the tail shape can look deceptively different from a fully feathered tail. The color pattern of the head and neck offers another distinguishing feature. Notice in the photo above that the Cooper’s Hawk looks as though it is wearing a cap. There is a break (lighter section) between the head and back, and usually the “cap” is darker in color. A Sharpie has a more hooded look – a uniform color that runs from the head down to the back. If, however, it is an immature Cooper’s or Sharp-shinned, you will see a striated head with no hood or cap to help with the ID. Immature Sharpie with yellow eyes, brown back, and a striated head pattern. 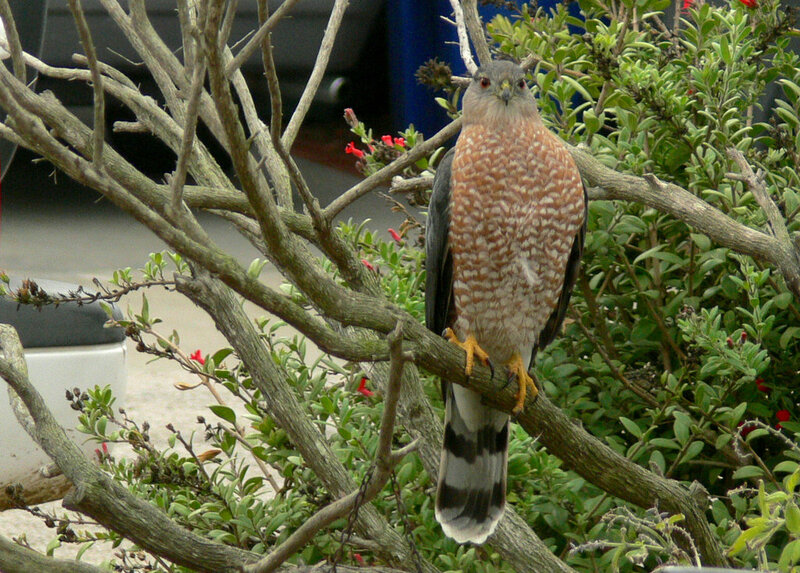 Both Sharp-shinned and Cooper’s Hawks live across the U.S. 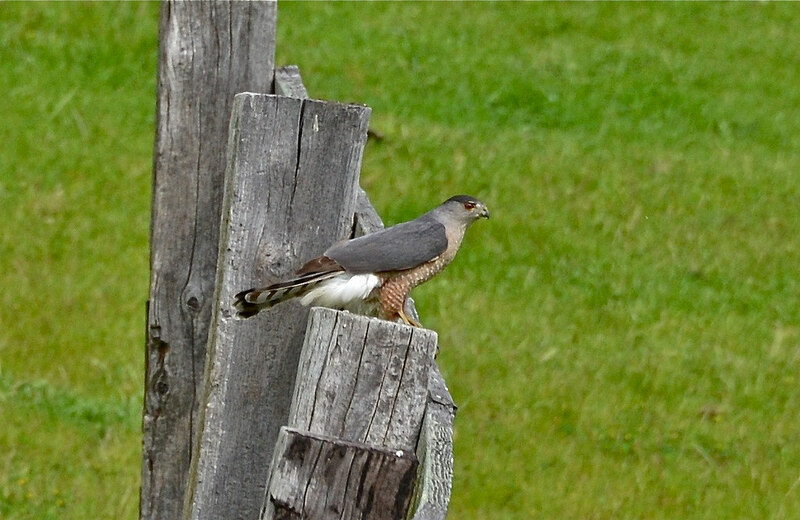 The Cooper’s Hawk, however, is only found in the southern part of Canada, while the Sharp-shinned Hawk is found as far north as Alaska. Both will prey heavily on birds. The Sharpie’s diet is almost exclusively birds, while the Cooper’s Hawks also prey on many mammals. 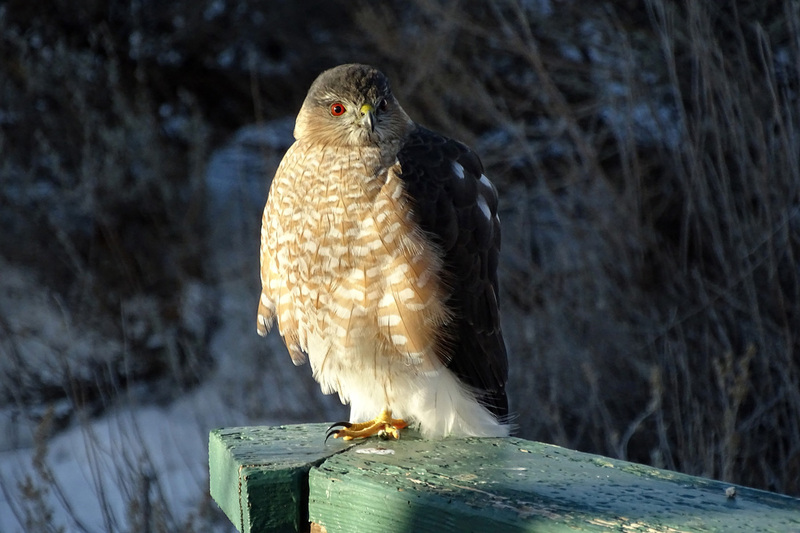 Sharp-shinned and Cooper’s Hawks have learned that areas with bird feeders provide profitable hunting grounds. Even so, raptors are not the efficient killer that people often believe. As an example, hunting Peregrine Falcons and Cooper’s Hawks may only be successful 20% of the time. Although I have not found a statistic on Sharp-shinned Hawks, I have witnessed a much higher rate of misses than kills. 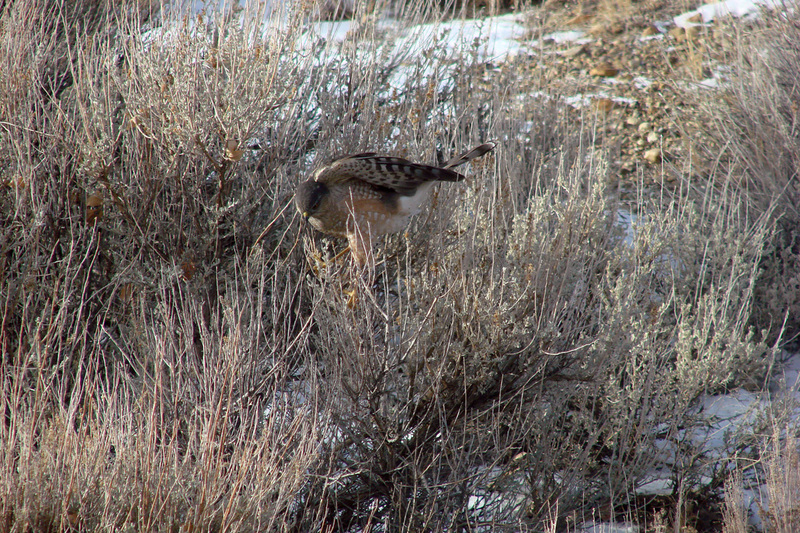 Sharp-shinned Hawk trying to flush sparrows from the sage brush. Over the years, I have had some conflicting feelings about “inviting in” concentrations of small birds, only to have a raptor swoop down and grab one up for its meal. I have felt particularly sad when the bird that is captured is a species of which I only had one or two visiting the yard. I love and appreciate raptors. I have learned over the years to accept this struggle knowing full-well that I am helping many little birds to survive harsh winter conditions. I also accept and understand that the unintended side effect is that I am helping raptors survive as well. If the raptors are unable to make enough successful kills, they will starve to death. Depending on the size of the hawk, as well as the size of the prey, most bird-eating hawks must consume one to three birds a day. Young raptors are even less adept at hunting than adults, and in many species 50% or more do not make it to breeding age. If you wish to help out your little seed eaters, you can offer them extra cover to flee to when a raptor arrives. Place your feeders within 15 feet of natural cover such as trees or bushes that small birds can escape to. You can also create artificial cover, such as a pile of trimmed tree branches, or old Christmas Trees near your feeder. Unfortunately, however, cover also hides the approach of other predators such as neighborhood cats. And no matter what you do, hawks will still continue to hunt at your feeders. Even though you can not see the breast markings, this Sharpie can still be identified as an immature due to the yellow eye color, and brown back. The Sharp-shinned in the above photo was unsuccessful when it swooped down to our cracked corn feeder. If over the winter this hawk frequently failed to make a kill, it likely did not survive. 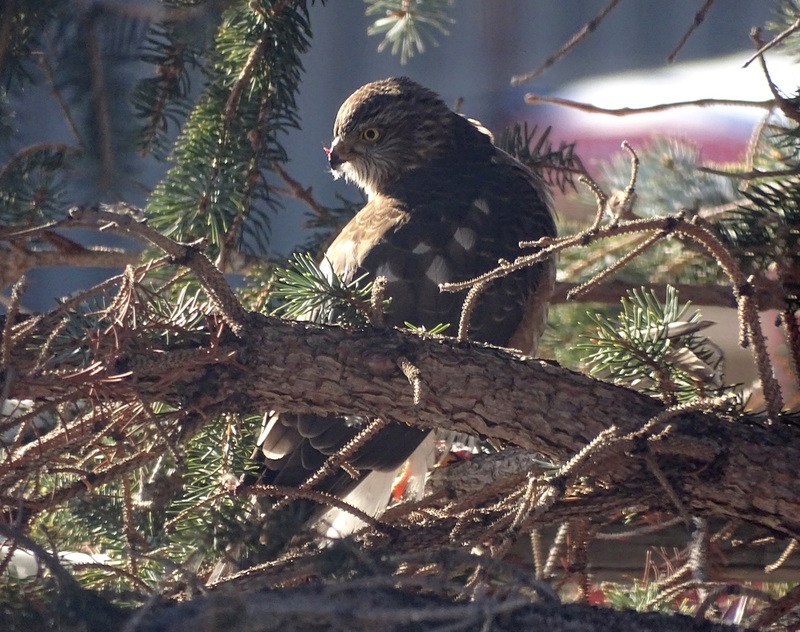 For young Sharp-shinned and Cooper’s Hawks, most hunting attempts end in failure. It is illegal to harass, trap, or kill these visitors. Hanging bird feeders is a benefit to both the small birds and the raptors that feed on them. If this is unacceptable to you, the only real choice is to not provide seed for wild birds. So . 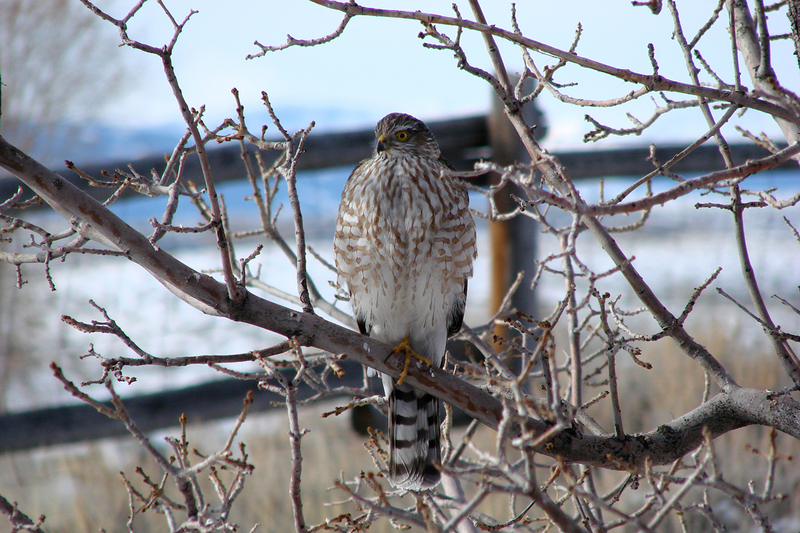 . . are Sharp-shinned Hawks, Cooper’s Hawks, and other raptors really uninvited? If you place bird feeders in your yard they will draw small birds in. If you have a concentration of small birds, you may have, although unintentionally, invited in hawks.